You could say it’s “ace” that more than 600 farmers and multiple agencies are working together to improve water quality in the Aparima catchment area in the deep south. The ace thing about ACE, says DairyNZ’s strategy and investment leader for responsible dairying, Dr David Burger, is its enormous scale and the intent to support all land managers in good farming practice. It will also track what happens on every single farm in the six Aparima catchment groups – Pourakino, Lower Aparima, Orepuki, Mid Aparima, Upper Aparima and Waimatuku – and relate this to water quality downstream. Robust science is a key ingredient of DairyNZ’s drive towards improving water quality, Burger says: “For example, in terms of the science being employed to mitigate contaminant run-off from farms, we are trying to understand the relationship between the contaminant load upstream and downstream values. “We need to have a high level of certainty we are focusing on the right area [of cause and effect]. It is not an easy task because the way in which contaminants flow and change between the source and the receiving environment varies within and across catchments. That said, DairyNZ’s scientific exploration of the complex subject of water quality is designed to identify best practice interventions that can be applied as quickly as possible, he says. •Edge of field mitigation – tools like wood chip bio-reactors, constructed wetlands and detainment bunds are placed on the “edge of field” to improve the quality of the water before it enters waterways via farms. DairyNZ is working with NIWA and other agencies to understand how effective these tools are and how to optimise their design to ultimately support greater uptake by farmers nationwide. 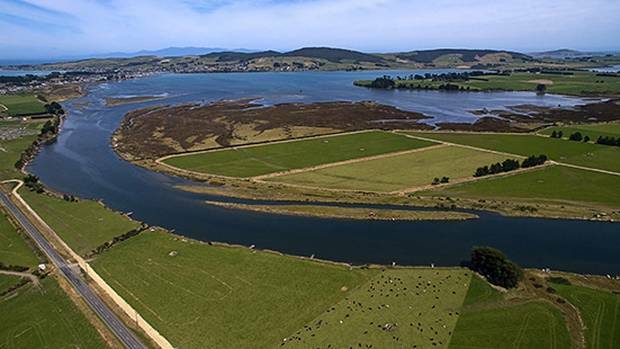 •Riparian planning tool – DairyNZ’s Riparian Planner helps farmers set up a plan and advises on suitable species to plant and how this work should be carried out. It won an award by the New Zealand Association of Resource Management for Outstanding Contribution in 2016 and more than 2200 dairy farmers have used this tool. •Effluent management – farmers have improved effluent infrastructure and practices across many regions. “Ten years ago, non-compliance rates were 17-18 per cent in some regions; that is now down to about five per cent or less,” says Burger. Those figures have been criticised by some commentators, saying they do not cover smaller streams flowing into larger streams but Burger says: “We started this programme many years ago as a nationwide, voluntary initiative because we wanted the sector to get on that journey – covering waterways wider than a metre and deeper than a gumboot.